So often, tile floors can become problematic. This is because most tile floors come with lightly colored grout lines. Even when floors are cleaned frequently, these grout lines can easily become stained and darkened. Luckily, at Modern Stone Care we offer professional tile cleaning services in Houston. These services are offered in order to save the appearance of your tile and grout floors. At Modern Stone Care we have years of experience providing tile cleaning and maintenance services. Our specialty is working with natural stone tile and grout. Tile and grout flooring tend to need the most care because of their easy ability to become stained and dirty. 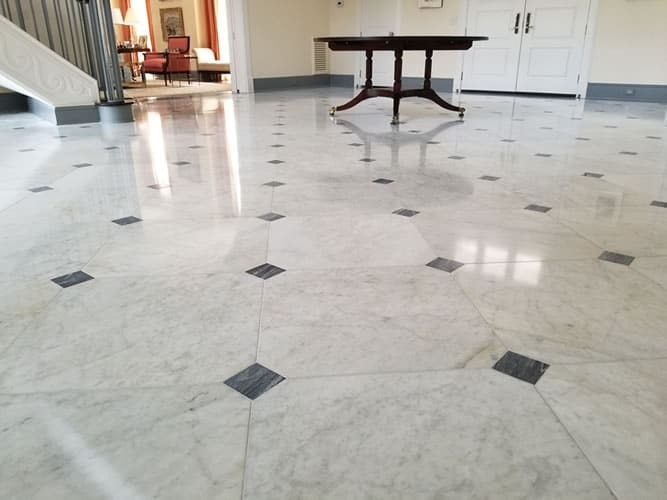 It is important to keep your floors regularly cleaned at home, but natural stone and tile floors require professional attention as well. The light colored grout lines are especially vulnerable. They lie lower than the tile, making it very easy for dirt and grime to get trapped and eventually impacted. This impacted dirt and grime will lead to hard to reverse damages, such as, staining and black lines. This will make your floors appear to be dirty, even after you have cleaned. Keep your tile and grout flooring looking nice, with our Tile Cleaning Services in Houston. Grout is the rubbery filling used to separate and hold tiles into place. Most often you will find that grout is a light color and is indented below the tiles it separates. These factors make grout vulnerable to staining because it traps grime, crumbs, dirt, moisture and more in its folds. Often, once tile and grout floors become deeply stained with blackened grout lines, owners believe they cannot be cleaned and restored to a nice bright color. This is not the case, at Modern Stone Care, we have the knowledge and experience required to reverse the damage done to your tile and grout flooring. Our tile cleaning services in houston restore the deepest and darkest set-in stains, improving the grout by several shades. Do not give up on your tile floors or stained grout lines! Instead, call the experts at Modern Stone Care! We have saved many clients from redoing their floors with our deep cleaning services. Just because your tile and grout lines are not super stained or blackened, it is important to keep them regularly cleaned and well maintained to avoid extreme staining and damage. It is recommended to have your tile and grout floors cleaned one to two times a year, based on traffic and lifestyle. Homes with children and animals tend to have more traffic and therefore need more maintenance than spaces with less traffic. Contact us today to learn more about our excellent tile and grout cleaning services.